FORS Vehicle Graphics Service (FORS VGS), produced and distributed by RGVA Vehicle Graphics, provides high quality FORS ID graphics and warning signage graphics for your vehicles, all at a discounted rate for FORS members. All graphics are high quality 3M-approved and come with a three year 3M matched component system warranty guarantee. They are also all PVC-free and made using degradable vinyl which breaks down under landfill conditions without emitting toxic gases or other pollutants. FORS ID vehicle graphics display your company’s level of accreditation (Bronze, Silver or Gold) and your unique FORS ID number. Displaying your FORS ID is not a FORS mandatory requirement, however it may be a contractual requirement. Please remember that you must display your current level of accreditation, and remove any FORS vehicle graphics immediately if you are no longer FORS accredited. FORS Standard ‘V7 – Vulnerable road user safety’ requires operators to fit vehicles over 3.5 tonnes gross vehicle weight with blind spot warning signage. 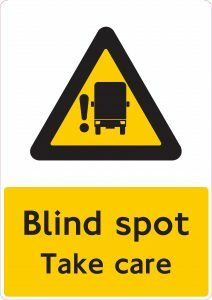 FORS guidance is that the signage should warn of the hazard and advise other road users to take appropriate action, for example ‘Blindspot – Take Care’. Please note that FORS does not support ‘stay back’ messages and would ask that all existing ‘Cyclists Stay Back’ warning signs be replaced with this new version, which has been designed in conjunction with the cycling community. If you would like to use an alternative printing service, please feel free to download the FORS approved warning signage templates below, and your unique downloadable FORS ID template can be found on your FORS organisation dashboard.